How do you take care of succulent seedlings - help! How do you Take Care of Succulent Seedlings? Congratulations! Your succulent seeds germinated, but now what? How do you take care of your succulent seedlings to get them to grow to their glorious adulthood? The hard part is over - the germinating. If you've planted those tiny dust-like seeds in rows (as I suggest) then it's easy to give them the care they need to achieve their full size. Be warned - it takes a long time for those tiny seedlings to grow big enough for their first transplanting, a crucial milestone in growing succulents from seed. Whether you had enough seeds for a whole flat (or more) sowing them in rows gives you a good idea of a) how many you've got and b) where they are. It's crucial to use sterilized potting soil so that weeds don't germinate at the same time - it's impossible to get those weeds out from between the tiny succulents without pulling up the desirables too. Find out more about pasteurizing soil here. Once the rows of succulent seedlings show, it might be hard to resist poking at them and over watering them. Water by spraying in between the rows with a sprayer, just enough to provide what nature provides - think of it as dew. Those little roots will be encouraged to seek out the moisture and it's important not to let the crowns of the plants get wet at this stage. The risk of 'damping off' is real. Even succulents are susceptible to the fungus infections and bacteria that this syndrome is made up of. I recommend using turkey grit, specially produced granite that birds need to 'chew' their food. It's the perfect size to cover the soil as a mulch. This prevents algae from forming (especially prevalent when using well water) and also gives the roots a chance to stay cool, and moist for a short while. 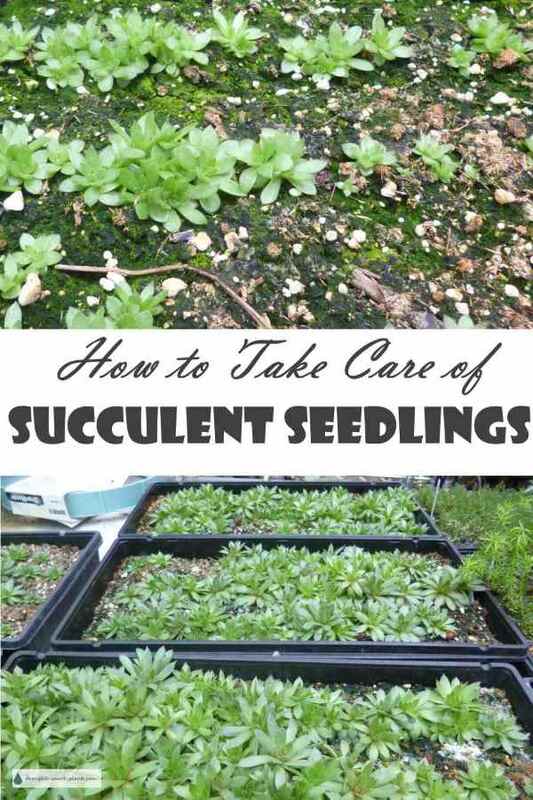 I urge you not to coddle your succulent seedlings too much. Keep an eye on them, but don't baby them. Tough love produces the strongest of plants. Cull any that are showing signs of disease, and if they look like they're being attacked by insects by all means spray them with insecticidal soap, diluted to the strength listed on the bottle. Baby succulents are not the place to use homemade remedies or strong chemicals. Chemical fertilizers are not necessary either. Water - what's the best for baby succulents? Being on a well, I've discovered the drawbacks to using well water. First, it's extremely cold so it's vital to 'temper' it (warm it up to room temperature) before using it. Second, the risk of algae forming is a lot greater with water from a well - after all, it's probably collected in the well after running over the ground at some point, so it's bound to have some contaminants in it. I recommend using rain water collected off the roof into a bucket or barrel. Keep it as clean as possible. Put it into some plastic bottles and store it in a dark cool place until you need to use it. 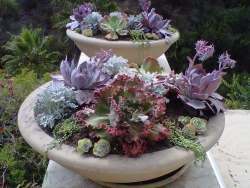 Succulents in general, and seedlings in particular don't require much, so a couple of jugs of stored rainwater will go a long way. Third choice if you have no access to the other two options is to buy bottled water that has been run through a reverse osmosis system. In time, once your little plants are at a certain size, they'll seize up and stall. This phenomenon is caused by several things; one factor could be light levels, and especially day length. If you're growing succulents from seed in the winter, you will need a grow light to even out the length of daylight they get. The other factor that I've run up against, and it took a long time to figure out what was going on, is that the soil needs buffering with dolomite lime to make the nutrients in it available to the plants. Sprinkle it over the plants and soil with a flour sifter. Spray afterwards with a fine spray to rinse it into the soil. Within a few days you'll see some growth start to happen.